Color: Warm brown silk with matching beads and holographic sequins. Description: Gorgeous Bollywood Indian shoe style. Our khussa Indian shoes are handmade using top-quality leather and are designed by us at Beachcombers. Only 24 pair of each style is made! These shoes really are handmade. You may see flaws and marks on the shoes. These generally cannot be seen from a standing position. Wide Width or Half Size? SIZE UP to the next whole size. Consider adding one of our double-thick foam insoles. For example, if you are normally a size 8 wide, buy a size 9 khussa and add a pair of insoles for a perfect fit. If you are normally a size 10.5 medium width, buy a size 11 khussa, and add a pair of insoles for a perfect fit. Additional sizing help is available at the sizing tab above. Trying to Match a Dress or Outfit? Computer monitors and light show colors differently. If you have a question about shoe color, I am happy to help via phone or email. Khussa Indian shoes are handmade for Beachcombers Bazaar in Pakistan with premium Pakistani leather and expert workmanship. How Do I Find My Khussa Jutti Shoe Size? Beachcombers khussa jutti are custom made and sized for consistent Beachcombers sizing. If you are a US size 8, you should be a Beachcombers size 8. 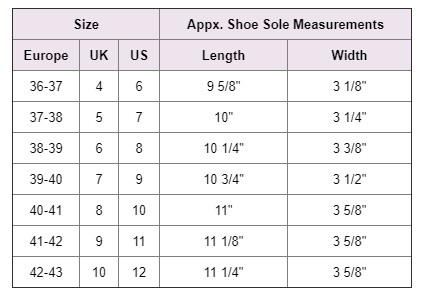 If you are a US size 8.5, you are likely a size 9. Beachcombers shoes are sized to be worn with your toe all the way to the end of the shoe (as they are worn in India & Pakistan). If you like a bit of extra room in the toe, size up. Each shoe listing will let you know the approximate sizes the shoes should fit. For example, a size 8 shoe will say "fits size 7.5-8." Since khussa/jutti form to the shape of your feet with a break in process, they are offered in whole sizes only. There are a few reasons that you'd want to size up in Beachcombers khussa jutti. We offer three ways to find your proper shoes size. They are below in the order of accuracy. When used correctly, this is extremely accurate. The key is to be sure it's printed to the proper scale. 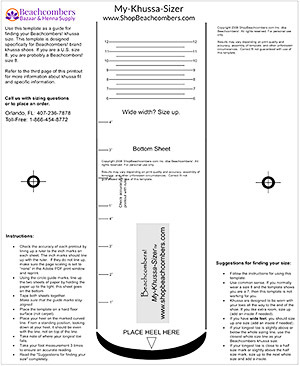 There are convenient measurements on the template that you can use to verify that it is printed correctly. Print the template at the below link. Send Jody and email answering the below questions. Copy and paste the questions into the body of the email and add your answers. Please answer ALL the questions. What size shoes do you normally wear? Do you ever size up or down a half size? If so, to what size? More than a half size? Are you feet wide, average, or narrow? Do you like to wear shoes tighter or more loose? Is there anything else about your feet to consider? You can expect a response within ONE BUSINESS day. Weekend requests will be answered on Monday. This is the least accurate method. Take a measurement of your largest foot and compare to the chart below. Take the measurement THREE TIMES to ensure an accurate reading. Add 1/4 to 1/2 inch to the measurement and get the next size up. Take the measurement on a hard surface. Carpet will give you an inaccurate reading. Take the measurements THREE times to ensure an accurate measurement. Trace your foot on a piece of paper and then use a ruler or tape measure to find the actual measurement -OR- lay out a tape measure and line your heels up exactly with the zero mark. Put all your weight on your foot and use that measurement. NOTE: Use common sense. If you normally wear a size 10, but the measurement is showing a size 8, then something is not right. If in doubt, size up. Each shoe listing will let you know the approximate sizes the should fit. The other two sizing options are more accurate than this one, so if something seems off, try one of the other methods that we offer.